My tummy growled a few times but it was tolerable. I didn't take a lunch break today and instead did some blogging. I brought grape juice from home, so I had that to sip on at work. 1.) The obvious reason I'm doing a fast is I want to lose some weight. You may think once I start eating again that I'll gain all the weight I lost back. And you're right... IF I go back to eating the way I did pre-fast. I am hoping the fast itself will break my addiction to unhealthy food. Regardless, I will have to use the same self-control I used while fasting and focus it on eating healthy and controlling my portions. I can tell you beyond a shadow of a doubt, I'm ready to do just that. I hate being overweight, I absolutely hate it. I decided in January, this would be my last 'fat' year and come January 2009, I would have my body back. Well, here it is October and I haven't come close to taking care of business. Fasting isn't fun and it isn't supposed to be. Fasting is the denying of self and no one likes to be denied (especially your stomach)! After the 40-day fast, I won't be at my goal weight but I'll be 40 pounds closer, God-willing. 2.) For several years, my husband, Paul, and I have wanted to have an outdoor family portrait taken during the fall season. But with each fall season that came, I refused to have a portrait taken because of my weight. Now that we have Brady (our 18 month old), I'm tired of waiting. So it was actually the family portrait that made me decide to do a 40-day juice fast. Last Sunday, while pondering the idea, I looked at the calendar and counted out 40 days. I saw that the 40th day fell on November 14th. I thought it was good timing because I didn't want to be fasting on Paul's and my anniversary, which is November 23rd and definitely not on Thanksgiving. A couple days ago, I called Misty Johnson Photography and booked an appointment. She was referred to me by a friend who had her son's portraits taken by Misty. I was so impressed, I decided I wanted Misty to do my family's portraits as well. I'm signing off for now. I have to go give Brady a bath and put him to bed. Weight: 231.6 / Total Lost: 9.2 lbs. Great job, food has been an issue for me as far back as I can remember, but what you are doing is really inspiring. I look forward to watching your progress. Do you use a certain brand of juicer? Amanda - Thanks! 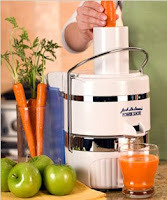 We use a Jack LaLanne juicer. Click on the image and you'll go to the website.